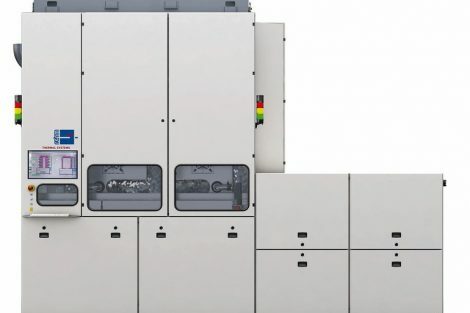 Diehl Aviation, an aviation supplier, decided on Rehm’s Condenso system due in part to its vacuum process, where the technology is adapted to the already existing, hermetically tight process chamber. The system has an effective and homogenous heat transfer over the entire PCB. The comparatively low temperatures used in condensation soldering make this process gentle. Safety is a top priority for the aviation supplier, which is why Rehm has shown great support in helping the company to carry out tests to ensure high quality components. Condenso’s vacuum system allows both the vacuum time and the desired final pressure to be adapted to the requirements of the assembly to be soldered. Combining vacuum and temperature profiling into one system, reduces failure rates and increases reliability. When boarding an aircraft, very few people think about how sophisticated and complex the technology is. Safety and reliability is taken for granted, as these flying giants are trusted without hesitation. Although this is by far the safest means of transportation, there are still millions of individual parts within an airplane that need to be trusted. How can such complex technology be made so manageable that people worldwide can get from A to B safely, quickly and comfortably every day? To no small degree, this is thanks to the co-operation of qualified suppliers who deliver reliable, thoroughly tested components to major aircraft manufacturers. Safety is always the top priority and guaranteed by the strict requirements and regulations of the supervisory authorities. Furthermore, only components with a long service life can be installed, as the average passenger aircraft is in service for around 30 years before being used for one or two decades more as a freighter, for example. Dresden based Diehl Aviation is one such supplier, who makes a significant contribution with its fail-safe and durable components. The company is one of the largest aviation suppliers in Germany. In addition to cabin components and electronics, they also specialize in the development, manufacturing and implementation of systems for water supply and wastewater disposal, as well as for fire detection and air conditioning in the aviation industry. They supply to well-known manufacturers, such as Airbus, Boeing, Bombardier and Embraer, as well as producers of small exclusive business jets. One of their systems is the Air Cooling Unit (ACU), which adds to passengers’ comfort on board by keeping food and drinks cool in the storage trolleys. The electronics of the ACU regulate sub-components, such as fans, valves and heating, on the basis of the measured values of several temperature sensors and the target temperature. The technology behind this must function reliably at all times under varying environmental influences, including temperature fluctuations or vibrations. Cooling is not the company’s sole focus, they also produce heating systems. As temperatures of minus 50 degrees Celsius and colder prevail at an altitude of 10,000 meters, water and wastewater pipes running between the outer skin and the cabin must be heated to prevent freezing. The Ice Protection Control Unit [IPCU] protects and controls heaters installed in the cold zones of the aircraft. Complete aircraft toilets and smoke detectors also have an important place in the company’s portfolio. Their smoke detectors have also attracted the interest of railway and tram companies, and are installed in the driverless underground trains in the city of Nuremberg. To be on the safe side, active and passive ageing tests are carried out by the company, in which the entire service life of the systems and the electronic modules they contain is simulated. “In passive tests, such as the toilet controllers, we use temperature ranges of – 50 to + 90 degrees, in active tests the components are subjected to endurance tests. All values are recorded, voltages and currents are measured, electromagnetic compatibility is tested, the whole gamut”, says Ronny Jahn from Production Engineering, who is responsible for electronics based technology and products. In addition, full-scale aircrafts are built in their test center to simulate every conceivable situation. “During these tests, we put our products through the wringer, as we simulate environmental influences as realistically as possible”, adds Jahn. “In order to meet the stringent demands our customers place on our products, we only use devices and systems that deliver the highest quality”, says Jahn. 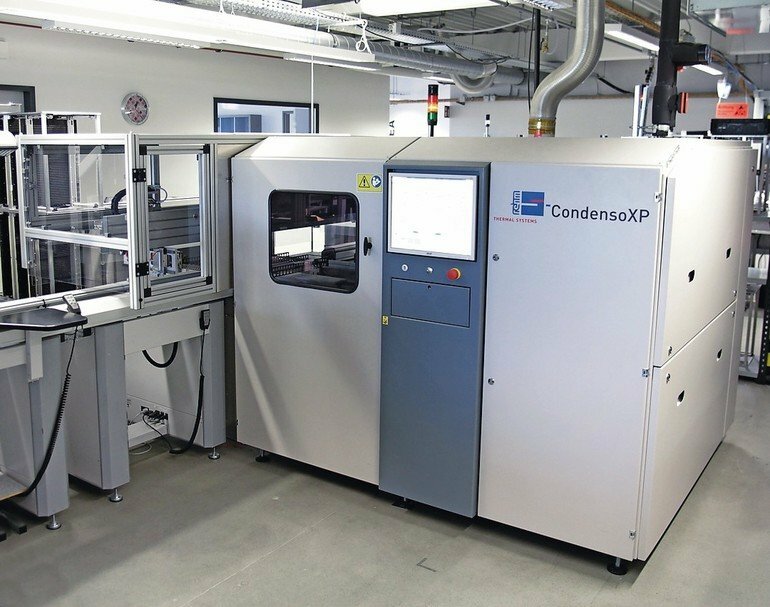 The company relies on condensation soldering systems from Rehm, the specialist for thermal system solutions. 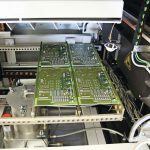 In order to make complex electronic components used in fail-safe and durable products, gentle manufacturing processes are required with high-demand being placed on the soldering process. 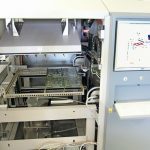 “Therefore, it was clear that the best solution for us would be a condensation soldering system, after the previous system was taken out of service. This enables us to keep the thermal load on the modules low, which has a positive effect on their reliability and longevity. Because it is our job to ensure 100 % quality”, adds Jahn. 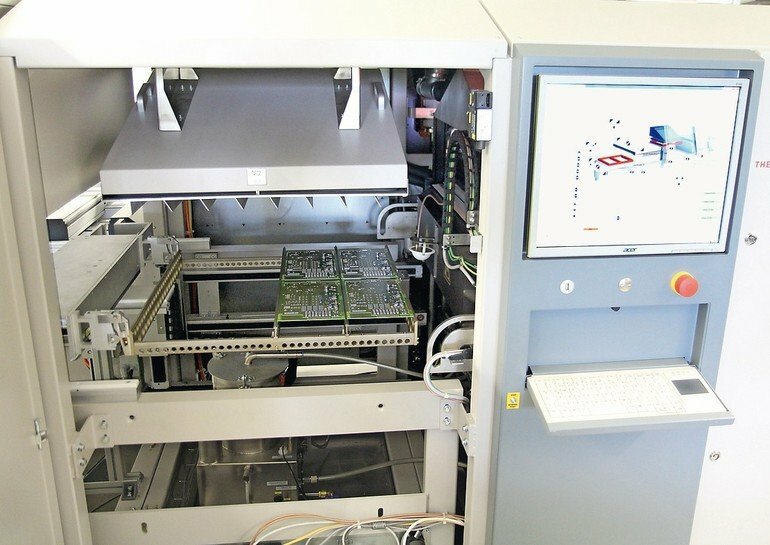 The comparatively low temperatures used in condensation soldering make this process gentle: “Using Galden as a medium, we limit the maximum achievable process temperature to 215 degrees. 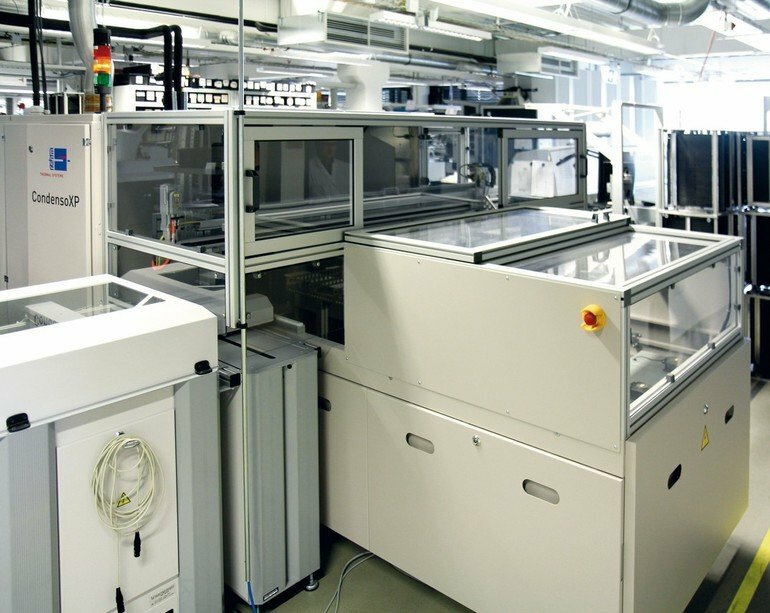 This means that the module can never exceed this maximum temperature, which is its boiling temperature”, says Jahn. The large and uniform heat transfer during this type of soldering leads to small temperature differences, between small and large thermal masses on the module. 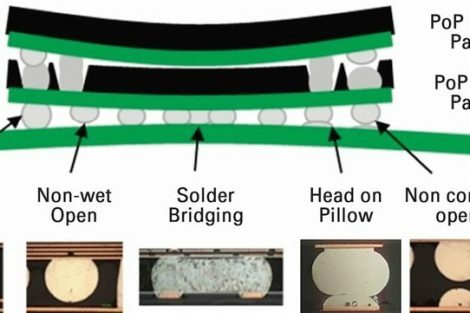 Up until now, conventional condensation soldering systems have had serious disadvantages in that the modules have to be vertically immersed in the vapor blanket. Also, since the condensing temperature of the vapor can change because of partial pressure of the mixed air, it makes it impossible to have a reproducible influence on the temperature curve. This disadvantage also effects horizontal transport, in which it was previously not possible to determine the vapor available for condensation. 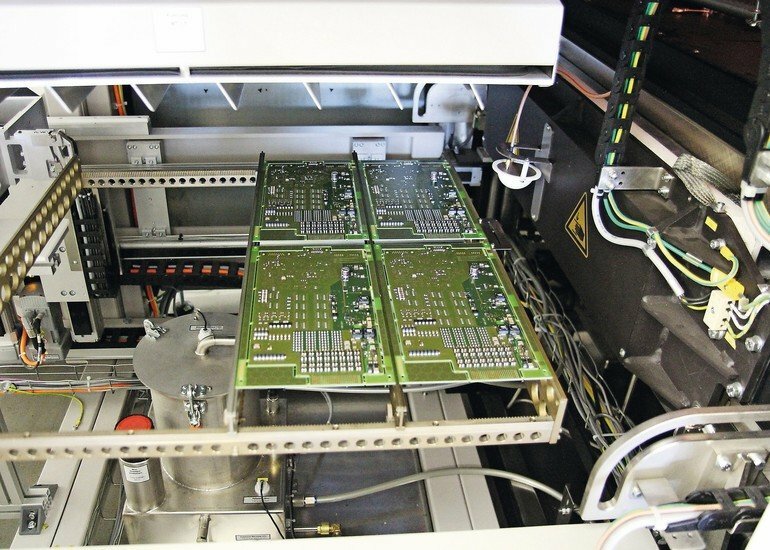 Rehm’s team of technicians and engineers were able to find a way to eliminate the disadvantages in the previous condensation soldering process. The solution is liquid Galden, which is fed from a storage tank via an injection pump into the process chamber. A volume counter measures the quantity of the liquid and closes a shut-off valve when the defined quantity is in the chamber. The Galden evaporates on the heated floor of the process chamber and settles down onto the assembly. 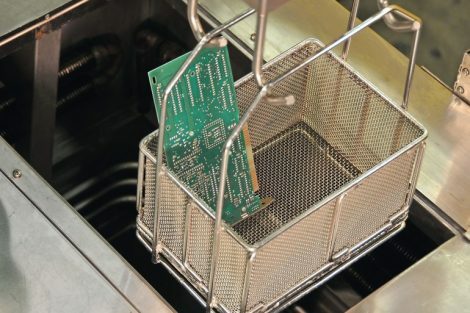 The influence of the temperature curve over the quantity of liquid can therefore be so precisely regulated that reproducible soldering results are achieved. 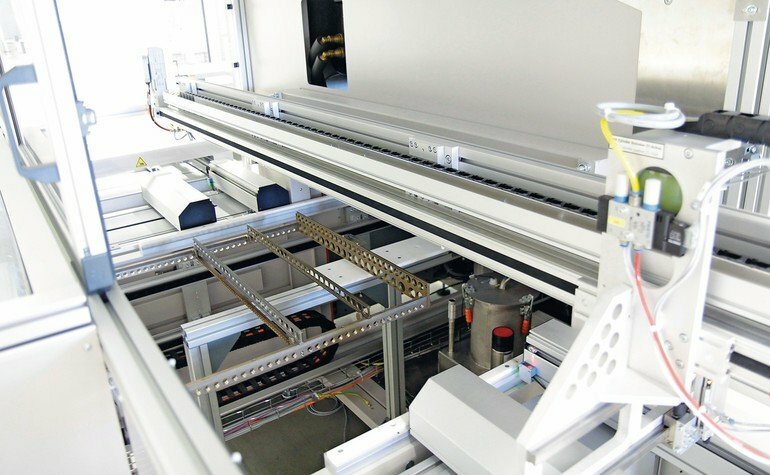 “The liquid quantity influences how quickly the temperature rises, and in turn the soldering profile”, says Alf Schadel, responsible for Technical Sales East. 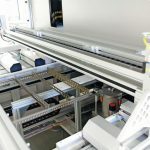 A major advantage of this solution is that the solder material can be transported horizontally through the system, which saves time since a production line operates horizontally. 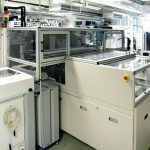 “Another striking argument in favor of Rehm is that the solder material is kept safely stationed in the process chamber during both the pre-vacuum and the soldering process and there is no slippage of components on the assemblies. With other solutions on the market on the other hand, Galden or another medium is continuously heated, creating a vapor blanket into which the module is raised and lowered on a product carrier. These solutions would not have given us the reproducible process we require”, says Jahn. Diehl was also convinced by the simple implementation of the vacuum process, where the corresponding vacuum technology is adapted to the already existing, hermetically tight process chamber. This helps to avoid the oxidation of the components or the drying out of the solder paste or adhesive. It also stops voids from occurring by outgassing volatile substances from the solder paste. 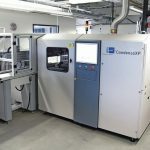 As this eliminates the need for additional handling through transport to another vacuum chamber, it saves a great deal of time between the start of the pre-vacuum process and the start of the soldering process. Furthermore, Condenso’s vacuum system allows both the vacuum time and the desired final pressure to be adapted to the individual requirements of the assembly to be soldered. Jahn adds: “They were always there when we had questions and helped us quickly and without any fuss. From the very beginning, we were able to carry out soldering test, we were shown what solder profiles were possible, we were able to prepare assemblies and we could see what adjustment options we had to optimize the process. And even now, when the CondensoXP is in daily use, Rehm is at our side when needed”. In this way, Diehl Aviation can continue to supply aircraft manufacturers and mobility service providers with fail-safe technology and ensure that air and rail traffic remains safe. Das Zusammenspiel qualifizierter Zulieferer ermöglicht, dass absolut zuverlässige Komponenten den Weg zu den großen Flugzeugbauern der Welt finden. Dafür ist eine Kondensationslötanlage im Einsatz, die materialschonende Fertigungsprozesse garantiert. L‘interaction de fournisseurs qualifiés permet à des composants absolument fiables d‘accéder aux principaux constructeurs aéronautiques mondiaux. 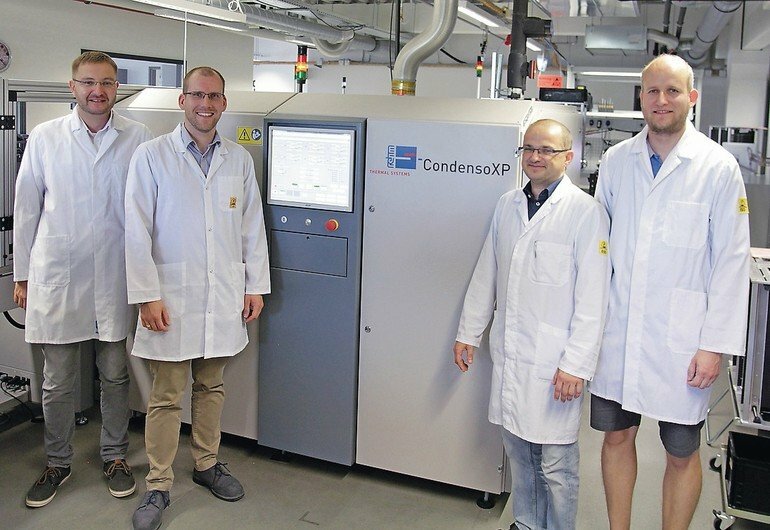 Pour cela, une machine à souder par condensation est utilisée, ce qui garantit des processus de fabrication économes en matériel. Взаимодействие квалифицированных поставщиков позволяет абсолютно надежным компонентам найти свой путь к крупным самолетостроителям. Для этого используется установка конденсационной пайки, которая гарантирует процессы изготовления, обеспечивающие бережное отношение к материалу.